Then there is my wife Marie. I’ve long held a theory that deep Derbyshire sheep farming roots have inbred a unique toughness and determination within my dearest beloved… and I’m in no doubt the more mysterious the man the more she’s intrigued. 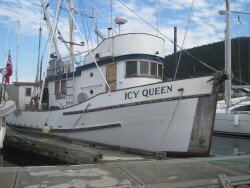 She does not give up easily and the skipper of Icy Queen soon gave way. Marie wore him down as I knew full well she would. It took a little time at first, using all the tricks she knows… loving their dog, excitedly inspecting their catch, admiring their boat and asking the questions they loved. I tried to smile but sometimes would think ‘hmmmm’… they were getting along just too fine. Of course, I noticed the skipper talked more and more with Marie but kept his wary eye on me. But I was slowly making a good friend with Icy Queen’s young Braydon as well. Then we got fish. We gave them six pack beer in return and the old barter trade began. Young Braydon came onboard Sänna and we drank and talked and listened till late in the night about his vastly interesting life, how he fished out in the sea for weeks and weeks, just him and his father and their mangy loveable mongrel dog. It was memorable. Maybe he didn’t realise but me and Marie thought it was as good as it can be. Some days they gave us fresh halibut and sometimes big cuts of delicious king salmon or a strange oily fish, black cod, for which Marie didn’t care much. I though it was grand. A few nights later, Marie’s hard work paid off and we got an invite onboard Icy Queen to look around and to drink their canned beer until the sun showed its early head. 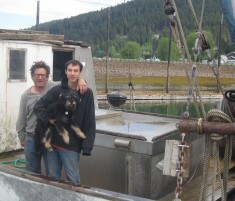 I talked with the skipper about how good it must be to share his son’s life in such a wonderful way with their bedraggled adorable dog, and from then on I saw I had Scott’s genuine friendship too. We traded more beer for their fish and also their respect. It’s easy for us to make friends with those German and Yankee sailors, we meet them all the time. To get the friendship of these far north fishermen is something hard earned and meaningful. Of course, my Marie wore them down until these tough Alaskans were sorry to see us leave… just as I knew she would.